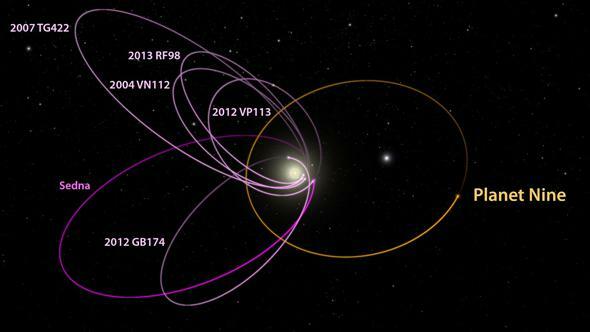 Evidence found of a possible planet in the outer solar system. Artwork of a possible planet far, far away. Wednesday, a pair of astronomers announced potentially very exciting news: They have found evidence that another, massive planet may exist in the outer solar system. If it exists, it is likely to have roughly 10 times the mass of Earth, maybe something like Neptune in size, and orbits the Sun on a tipped, elliptical path that never brings it any closer to the Sun than 30 billion kilometers (translation: It’s very far away). Neptune is the most distant known large planet from the Sun. Out past Neptune there’s a huge population of icy objects on various kinds of orbits. These objects are difficult to observe because they’re not very big and they’re very far away, so they’re faint. Still, quite a few have been found. The region is called the Kuiper belt, so we call these bodies Kuiper belt objects, or KBOs. A couple of years ago, a pair of astronomers (Chad Trujillo and Scott Sheppard) noticed something peculiar about the most distant of these objects we’ve been able to find. You’d expect them to have randomly oriented orbits, pointing in different directions. However, what they found instead is that they seem to all be oriented in a similar fashion. The orbits of six KBOs, and the possible orbit of the alleged planet. Note how the KBOs all have roughly aligned orbits. The drawing above shows the orbits of six of these KBOs (in purple), and you can see they all have their long axes roughly aligned. Moreover, several other aspects of their orbits also seem to be suspiciously similar (for people who want gory details, their arguments of perihelia are all clustered around a value of 0). This is incredibly unlikely to happen randomly. So another pair of astronomers, Konstantin Batygin and Mike Brown (full disclosure: Mike’s a friend of mine), looked into this. There are a few ways to get orbits to align like this, but the most likely given what’s seen is—you guessed it—the presence of a massive planet out beyond Neptune. 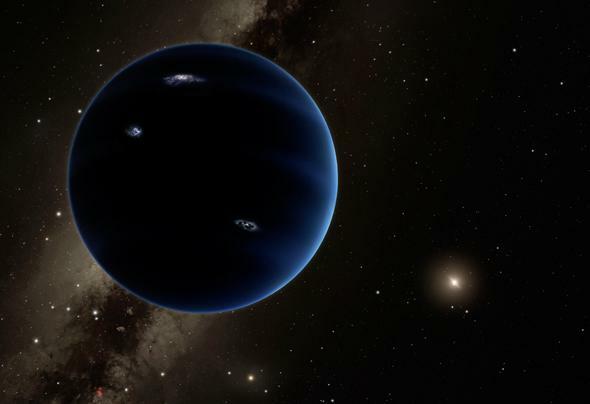 They’ve even nicknamed it: Planet Nine. The idea is that the objects started out with random orbits, but repeated close encounters with this purported planet nudged them into paths that all had similar characteristics. UPDATE, Jan. 21, 2015: To be clear: Trujillo and Sheppard postulated a planet in their paper, with some preliminary analysis; Batygin and Brown carried out the analysis much further. Batygin and Brown simulated what would happen to a population of the icy objects as they got tossed around by the planet’s gravity. Then, by changing the characteristics of the planet they could try to reproduce the current orbital alignments seen. The best fit was for a planet that never got closer than 200 AU from the Sun (1 AU is the average distance of the Earth from the Sun, about 150 million kilometers; Neptune is roughly 30 AU out form the Sun). The orbit of this planet would be highly elliptical, but it’s not clear how elliptical; that’s less well constrained. At its most distant, it could be between 500 and 1,200 AU out (75 to 180 billion kilometers). The most likely mass of the planet is about 10 times Earth’s mass (for comparison, Neptune is a little more than 17 times our mass), though it could be somewhat less or more. Interestingly, the planet is anti-aligned with the icy bodies (again, see the diagram above that has the orbits drawn, including the likely one for the purported planet). That is, its perihelion point (when it’s closest to the Sun) is on the opposite side of the Sun from the perihelia of the other objects. The way orbital mechanics works out, this actually keeps the bodies from colliding with it; when they’re closest to the Sun the planet is far away from them, and vice-versa. There are some side benefits of this possible planet, too; it may explain the peculiar orbits of the two KBOs Sedna and 2012 VP 113; both have perihelia that are farther from the Sun than expected. This planet would also fling objects into orbits nearly perpendicular to the other planets’, and we do see a few objects like that which are very hard to explain otherwise. It’s always nice when a hypothesis predicts phenomena we actually see. You are interested in the unknown, the mysterious, the unexplainable. That is why you are here. And now, for the first time, we are bringing to you the full story of what happened on that fateful day. We are bringing you all the evidence, based only on the secret testimony of the miserable souls who survived this terrifying ordeal. The incidents, the places. My friend, we cannot keep this a secret any longer. OK, so, great! A previously undiscovered planet might be out there, poking and prodding icy bodies and fiddling with their orbits. But … is it possible to even get a planet that far out from the Sun? It could’ve been thrown out a few dozen billion kilometers. It would’ve initially been on an extremely elliptical orbit that brought it back to the inner solar system. However, over time, the gravity of stars and the galaxy itself could have altered the shape of its orbit to what it is now. OK, so it could be out there. If it is, can we find it? Batygin and Brown crunched the numbers, and found where the planet is likely to be in the sky at various parts of its orbit. When it’s closest to the Sun—and easiest to find, because it’ll be brighter and moving the fastest—it’s likely to be in the same part of the sky as the Milky Way, meaning it’ll be tough to spot among the many thousands of background stars. Odds are we won’t find it then anyway, because it spends the least amount of time nearer to the Sun (because it’s moving faster). But when it’s farther away and in a less crowded region of the sky, it’s fainter and harder to spot. The planet isn’t as faint as I might have expected, ranging from a magnitude of 18 to 24 or so. That’s faint, but at its brightest it’d be visible to smaller ‘scopes, and even when it’s fainter it should be within range of upcoming sky surveys. If this planet exists, we may yet find it, and maybe in the next few years. I feel I should note that there have been a few claims like this before, even using similar ideas, but none has really panned out. One, using an unusual alignment in the orbits of comets, was proposed in 2011. The evidence was a bit shaky, so I was always skeptical, and now I doubt this works due to the WISE survey I mentioned above. Given all this, though, the evidence presented in this new case is much better. Again, it’s not proof, but I think it’s good enough that we need to follow up on it. More models need to be run to see what else this planet could do, effects that might help nail down both its physical characteristics and orbit. That will aid in finding it. To be honest, this is pretty exciting. I’m cautiously optimistic. It’s good to be skeptical, but from what I can tell, this stands the best chance of being real of any idea I’ve seen so far. It’s worth a look. And one more thing, because I can’t resist. Mike Brown was the leader of the team that discovered Eris, a large Kuiper belt object that is actually roughly the same size as Pluto. Its discovery eventually led to the International Astronomical Union’s “demotion” of Pluto to minor planet status (Mike’s Twitter handle is PlutoKiller). Whether you think Pluto is a planet or not (and I don’t even think that’s the right question), the irony of this is pretty funny. If this planet exists, it’s big, and there’s no doubt it would be classified as a planet. 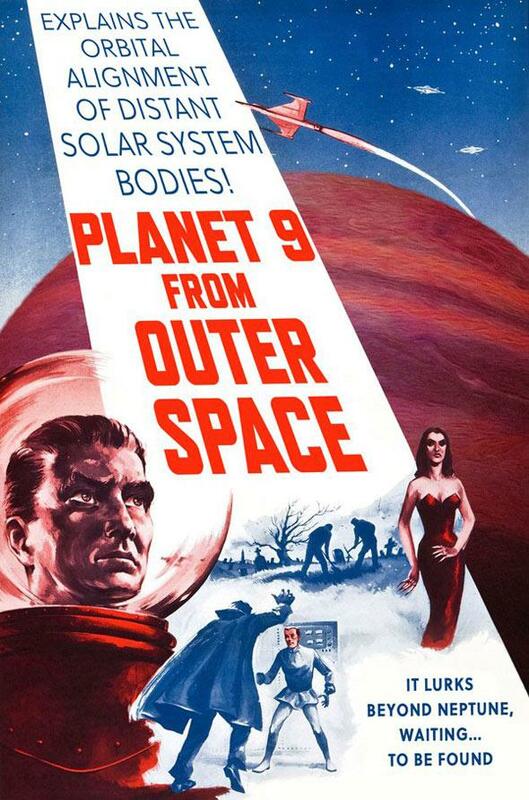 If Mike’s prediction works out, he’ll have both killed and discovered the ninth planet. *Geez, I hate to even have to say this, but I know a lot of crackpots will run away with this announcement—so: This has nothing to do with Nibiru, a silly conspiracy-theory-based non-existent planet that I’ve had to spend way too much time debunking multiple times in the past. Read that link if you’d like, but I won’t spare this another thought here.